Mexico is a huge country with hundreds of tourist destinations that appeal to all travel tastes and dreams. Don’t let the fear of the swine flu stop you from planning a trip to beautiful Mexico. Here are five reasons to visit our neighbor to the south. 1. Mexico City, or El Distrito Federal, is the oldest metropolis on the continent of North America. It stands over 7,000 feet above sea level and offers temperate weather during most of the year. If you want to immerse yourself in history and one of the largest concentrations of museums in the world, Mexico City is the place. Remember if you drive in Mexico, US and Canadian coverage is invalid. You need Mexican insurance coverage to travel. These 5 Reasons To Travel To Mexico are brought to you by Mexican Insurance Store.com a leading provider of quality Mexican insurance coverage online. 2. Mexico is more than just a cruise destination. Many people fly or drive to Mexico without ever stepping a foot aboard a cruise liner. When you fly into the international airport, you will discover a beautiful new terminal, T2, built by Mexico to accommodate the heavy air traffic coming through this bustling hub. 3. 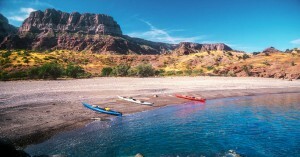 Baja California is the destination far flung from the Caribbean cruise crowd. Near the Sea of Cortez with its many underwater diving opportunities (think Jacques Cousteau), Baja includes the region of Los Cabos and the party hot spots of Cabo San Lucas. Baja is within driving distance of San Diego. Are you ready to run for the border? 4. Veracruz is a beautiful city by the Gulf of Mexico with architecture that spans nearly five centuries since being founded by Hernando Cortes. Here you can walk the streets, the shops, the museums, and the cathedrals or take a drive to visit the pyramid ruins. There are many opportunities for boating and fishing on the coast. 5. If you like to scuba dive in underwater caves, the Yucatan peninsula offers many diving destinations for scuba lovers. The Yucatan includes thousands of miles of underwater caves and caverns for people who enjoy eco-travel. While underwater scuba has its risks, experienced divers can return a thousand times for a different experience. Snorkeling is another option. Visiting different places in Mexico would require a protection which can be obtained through Mexico insurance. Without this insurance, you won’t be allowed to drive or travel legally in Mexico. From roadside stands to starred restaurants, Mexico is the best home to most great eats. You’ll know it’s true once you visit Mexico. Once you have your own car, you’re off to explore and have adventure. This requires Mexican auto insurance in the first place. Claim benefits are really helpful. There are lots of reasons to visit Mexico. Many people love beautiful beaches because they can indulge in resorts at the coast of Pacific Ocean or Gulf of Mexico. Vacations in Mexico provide wonderful opportunities to experience natural beaches, resort amenities and thrilling outdoor activities. These can be done if you drive to Mexico with Mexican insurance. Its about peace of mind, and understanding the risks associated with driving South of the Border without Mexican insurance coverage.